Do you have a fear of public speaking? Do you start sweating at the very idea of delivering a speech? Many people suffer from some form of anxiety, including panic attacks, when asked to stand in front of even a few people. Studies have shown that many of us are more afraid of public speaking than death! Unfortunately, there are many occasions where we simply can't avoid delivering a speech. Whether it's a business presentation, community event, or just a family gathering, there will always be times when you have to stand up and speak, so you might as well sharpen your speaking skills! Learning to speak in front of a group is very beneficial. Conquering that fear of public speaking could mean a raise at work, a more prominent role as a community leader, or more fulfilling relationships. Conquering your fear of speaking in front of a large crowd will certainly take some time and practice, but it's not impossible! 1. Prepare yourself. Prepare a game plan for your presentation. 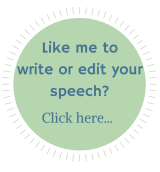 Choose your desired outcome and visualize your successful speech. 2. Get familiar. Learn everything about the area where you'll be delivering your presentation. Familiarize yourself with the stage, microphone, staff, the room's features, seating layout, and more. 3. Release your nervousness. You should be energized and focused on your presentation when you enter the room - not on how nervous you are. Begin by taking a few deep breaths to rid yourself of your tension. 4. Get personal. Imagine having a conversation with just one person in your audience. This will allow your presentation to become more personal to your listeners. 5. Make eye contact. Always make sure to look the audience in the eye so you can forge a stronger connection with them. Make eye contact with one person at a time - as if you're speaking directly with them. Don't spend too long looking at one person, though - it will make them feel awkward. 6. Keep moving. Avoid standing behind the podium while giving your presentation. This will make you feel disconnected from your audience. Walk around the stage or stand beside the podium when presenting your speech. 7. Know your audience. Research your audience while preparing for your presentation. This way, you'll know who's going to attend so you can better prepare yourself. 8. Stay positive. Keep a positive attitude when asked questions. If you don't know an answer to something, don't try to fake your knowledge. Just say: "I don't know," offer to find the answer after the presentation, then move on. 9. Accept invitations. When you're invited to speak at an event or meeting, always accept the offer no matter how nervous you feel. Remember: practice makes perfect! 10. Find a coach. Find a coach to help you strengthen your public speaking skills before the big day. This personal guidance will help you gain confidence and blast past your fears. Becoming an effective public speaker doesn't have to be stressful. Following these tips will empower you to overcome your fear of public speaking, while building strong personal skills that can unlock many new opportunities.